4 BR, 1 BA, Sleeps 8 Max. 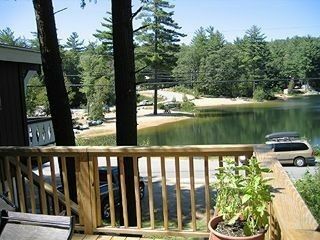 This charming chalet we've named 'Loon's Landing' sits across from a public beach on a pond in the Village of Eidelweiss, a vacation community in Madison, NH at the entrance to the Mt. Washington Valley. You can sit on the deck and call to people on the beach! The upstairs features a living room with a wood stove, large dining area, kitchen, bath, and the master bedroom which has a queen size bed. Downstairs are three bedrooms each with queen size beds, and a game area. The open post and beam architecture inside combines with a terrific mountain lake location outside to make this a delightful vacation setting! I've been a landlord of rental properties since 1999. Health, safety and comfort of my tenants and guests is top priority! My family has vacationed here since 1990. My wife and I are now retired and live about a mile from the chalet. The public beach is directly across the street. There are five beaches in Eidlweiss. Boulder Beach is across the street. There is a playground across from the beach. The pond across the street is one of three interconnect ponds. There are five beaches, two on each pond in addition to the one across the street. That's Oak Hill you'r looking at when you are on the deck. One large canoe and two kayaks provided along with life jackets, paddles. Large deck on side, small deck on the front. Very nice playground a few feet away. It's just 4 miles to Conway, and 7 miles to North Conway. In Eidelweiss you'll find: swimming (across the street), hiking, canoeing, snowshoeing, snowmobiling, fishing, and a playground. Enjoy a nice nature trail with a stream (just down the street) or relax on the deck listening to the loons while you watch the kids at the beach! The pond attracts a lot of wildlife including loons, beavers, foxes, turtles, coyotes, moose and deer. Nearby you'll find skiing, hiking trails, outlet shopping, golfing, tubing, dining, amusement parks (Storyland), Mt. Washington, miniature golf, antique shops, Fryeburg Fair (September/October), and much more! Whether you like relaxing or staying busy on your vacation, you'll find plenty of both at Loon's Landing!